A bit of time has passed since the last photo shown. After we reached the headwaters region of the Noatak River, Eric made a few passes along the river in search a suitable gravel bar on which to land his plane. The landing was exciting and expertly executed, and after our gear was unloaded we shook Erics hand and he blasted off with a short amazing burst of speed and flew off into the rain and clouds. The moment we had longed for was upon us: our boat, our gear, and ourselves were up a creek with nowhere else to go but downriver. 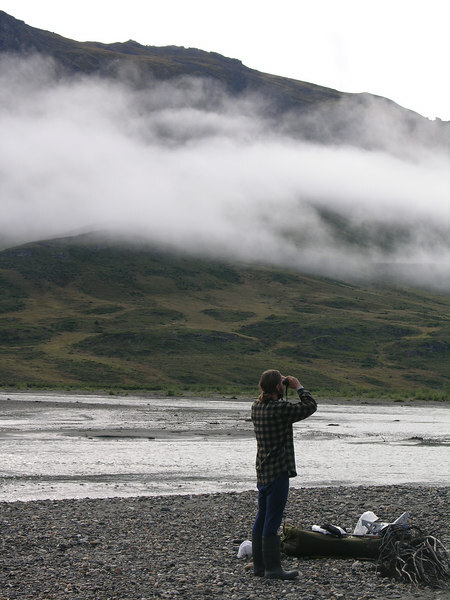 In this photo taken the following morning (Day 2: August 13) Ian is glassing for moose, caribou, muskoxen, wolves, grizzly bears, or dall sheep (we saw the first four critters from the air the previous day but had yet to see bears or sheep).